Anyone got a fire extinguisher handy?? I could swear my hair is on fire, the way I’ve been running like a crazy person! Today will be a short post — and probably the only post of the week due to work and my son’s graduation with an onslaught of grandparents, aunts, and boomerang kiddos. I can’t tell you how happy this space makes me! I love walking by this room every day! I’ll more to share once the dust settles around here, but I feel so good that I met my “deadline” for having a comfortable welcoming space for my guests! I hope you have a wonderful week everyone… I’ll be wrapping my time with my students (report cards! gah! ), doing some cooking for the big festivities, and finishing up decorations. Good stuff! 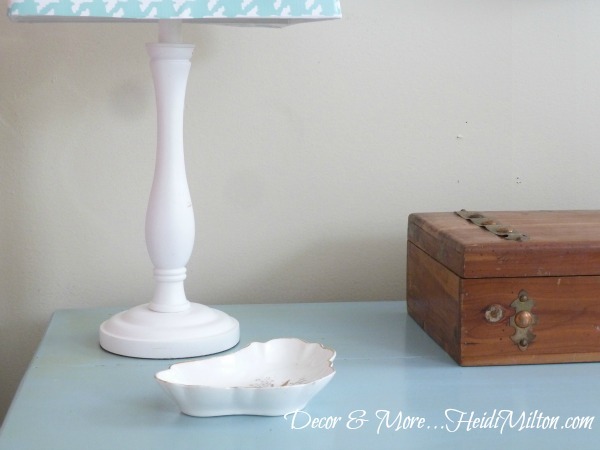 Check out the Houndstooth lampshade DIY, details on the artwork, and the dresser lamp makeover, too. 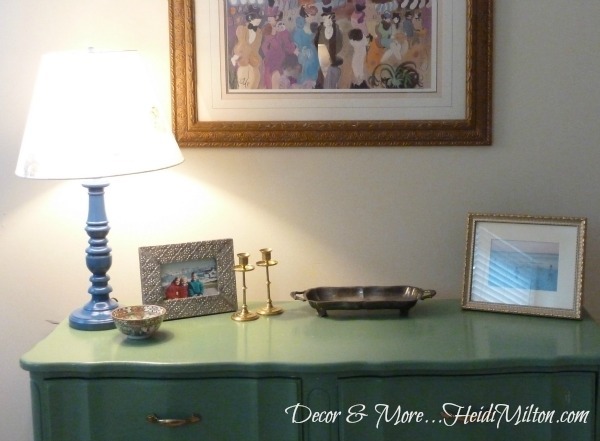 And I’ve also shared 6 ways to “go vintage” in this room. the room should make you happy. just love the colors that you have chosen. Did you make that map? have a great week. slow it down to enjoy it. it looks awesome! love the punches of pink- what a pretty space! cassie recently posted..Kitchen Update (Lighting Choices Revealed) and Weekend Fun! the room turned out wonderful! tara recently posted..Seven…a slow digestion. Love it all! Congratulations to your Graduate and enjoy the festivities! Love it! I’m crazy fit the pops of pink, that desk and that nap. I seriously love a pop of pink! Well done! WOW! 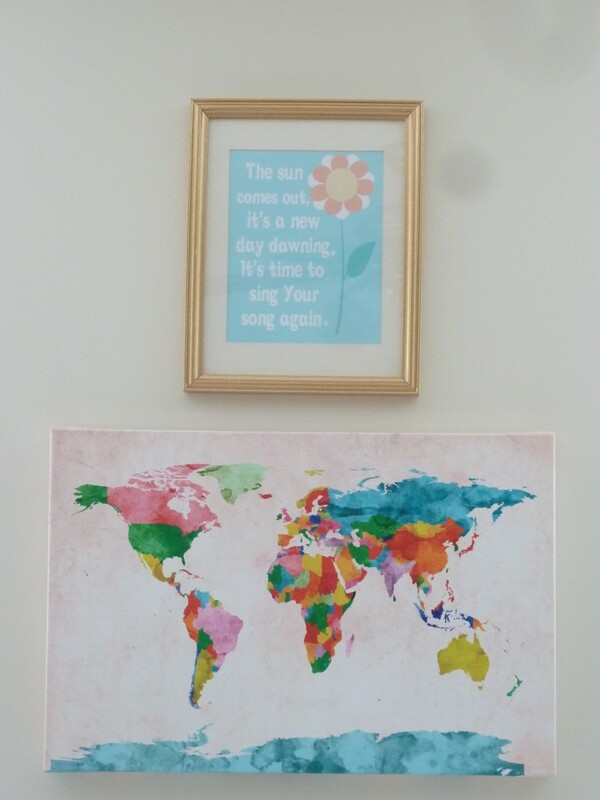 Big change – it’s beautiful!!! It’s sweet and cute! I’m sure your guest will have a good nights rest. 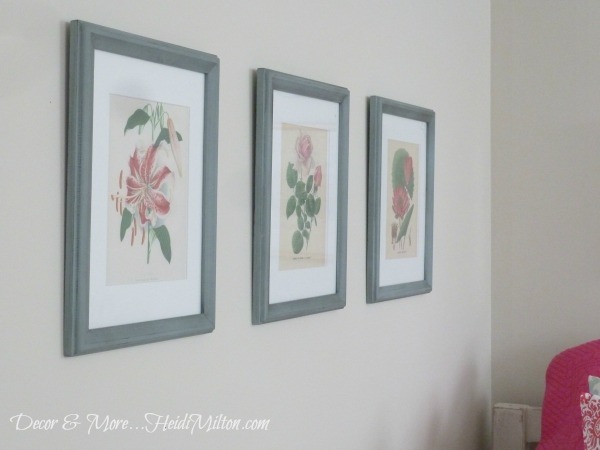 It looks great, Heidi! Love the pops of color! i am in LOVE LOVE LOVE!!!!!! aimee steckowski recently posted..a resting place. This room is amazing, it will be so welcoming to your future guests!! Hope you have a fun fill rest of the week and Happy Graduation!! oh WOW!! It is SOOO beautiful! I’m dying over that amazing color scheme. FABULOUS!! SO pretty and inviting! 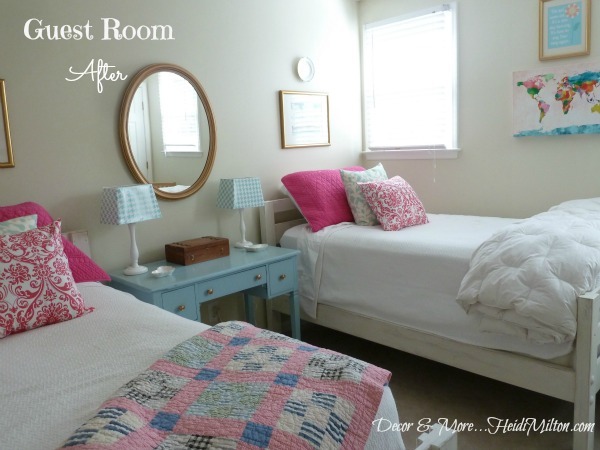 I love the old quilts on the bed, the blue table between the two beds…everything! Great job! Heidi!!! I am SO in love with your wonderful transformation! 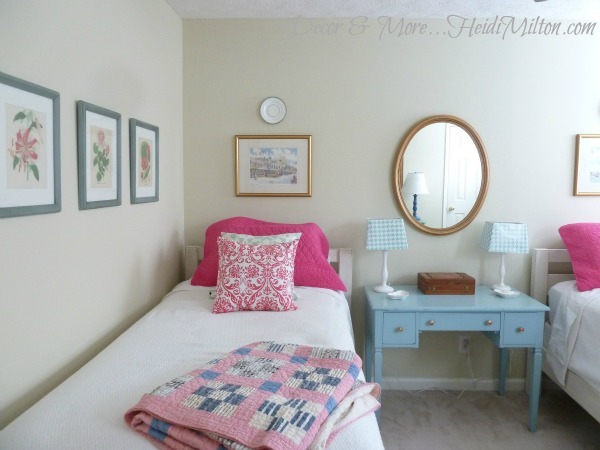 I just love the TWO beds and the entire look!!! Now you are all ready for me to come and visit right?! Seriously you did a perfect job! 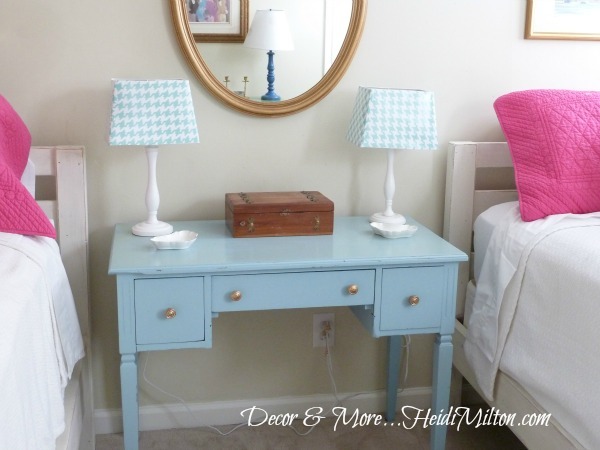 Love the desk between the beds – your guests will never leave! 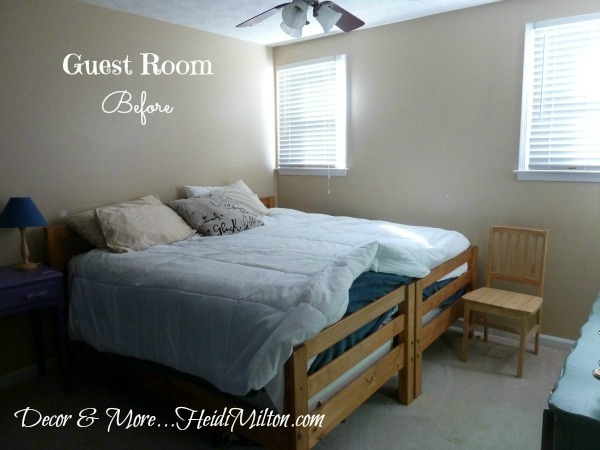 My poor guest room is now demanding to be as nice as yours!